Ben Blount’s “The Beloved Community” on display at 1731 Wesley Ave. Blount’s piece was a part of the 2017 Terrain Biennial, an inaugural local project connecting artists to residents. Private front yards, balconies and porches around Evanston have been transformed into public art spaces through an inaugural project connecting artists to residents. The 2017 Evanston Terrain Biennial, which is on display until Nov. 15, includes nine art exhibits around Evanston neighborhoods. Organized by local artists Anne Stevens and Mat Rappaport, the exhibits aim to foster dialogue on how communities respond to adversity. 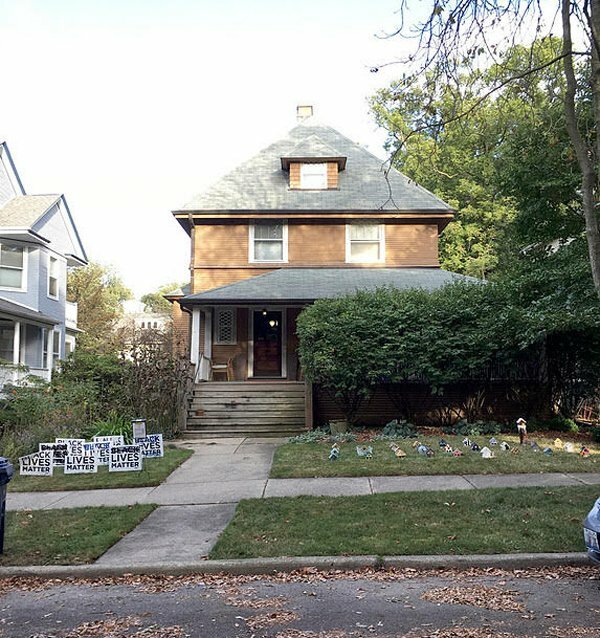 The Evanston event branches off the overarching Terrain Biennial, which was founded in Oak Park in 2011 by artist Sabina Ott and author John Paulett. Since then, the event has spread beyond Oak Park to 115 sites this year, with some as far as Marnay-sur-Seine, France. “One of the beauties of this model of exhibition is it’s a way of activating communities and what we end up seeing is the intersection of communities,” Rappaport said. Political commentary is a common theme in many of this year’s exhibitions, artist Ben Blount said. His work, “The Beloved Community,” creates a stark contrast between the ideal city and reality. Blount — who has lived in Evanston for three years — said his piece uses defaced Black Lives Matter signs to comment on previous incidents of vandalism in the city. While many of the exhibitions focused on local issues, some artists used their pieces to address ideas beyond Evanston. Rappaport, in conjunction with artist Patrick Lichty, created an exhibition that runs early news conference coverage of President Donald Trump on a 24-hour loop. The installation also invited viewers to respond to the current political climate by writing messages on blank picket yard signs. Stevens’ piece incorporates landscape artistry using tents with painted sleeping figures to highlight differences in time scale and progress. The art depicts how people continue to live their own local lives –– work, school, eat, sleep –– though they struggle with the erosion of policies that protect democratic society, she said. Audience engagement and community involvement are important factors in the exhibitions, Stevens added. “Evanston is a very arts-rich community and there is a lot of support for public art and engagement, whether it be murals or performance or festivals,” she said. Stevens said the close proximity of display locations encourages more participation. Exhibition hosts also serve as collaborators because they offered up their space for artists to use, she said. Rappaport said the event has been a great opportunity for him to meet with and engage other Evanston artists. “The more I become rooted in Evanston as my home and my community, the more interested I am in activating our shared spaces for dialogue and social change,” he said.